It the far future. The clones have rebelled against humanity (or what passes for it), but they did not get very far. They are still at the bottom of the dark metropolis and humans are at the top. However, in hopes of reversing centuries of sterility, humans will send explorers down to the bowels of the city. 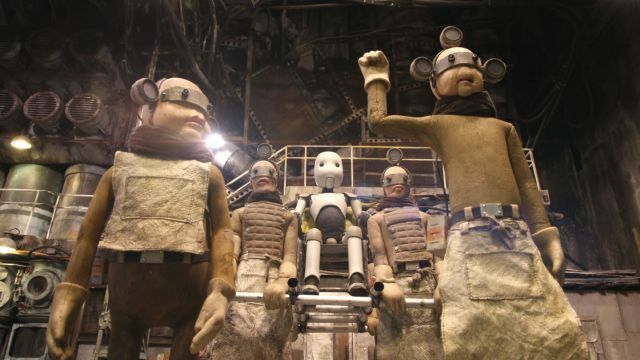 One intrepid surveyor finds some highly unusual genetic material and no end of trouble in Takahide Hori’s stop-motion labor of love, Junk Head (trailer here), which screens during the 2017 Fantasia International Film Festival. Our protagonist’s probe already looked like a rocket speeding towards the earth, but some of the lower level denizens decide to blast it with an RPG anyway. Basically, only his head survives the blast, but a semi-mad scientist operating in the ground-level region manages to fashion him a new head and mechanical body. This process will repeat, but the good mad doctor’s work looks rather sleek and stylish compared to the subsequent encasing. The journeyer initially suffers from amnesia after the crash, but another bump to the noggin bring back his past. Inconveniently, he temporarily loses his comprehension of lower level dialects, but he will eventually have both memory and comprehension. Unfortunately, by that time, his new androidal shell no longer has the capacity for speech. It is definitely one darned thing after another for our faithful traveler. Yet, he will learn quite a bit about what it means to be human from the clones, mutants, and genetic freaks he encounters down there. It frequently isn’t pretty, but it is always real. Visually, Junk Head is a flat-out stunner. Hori’s stop-motion animation is absolutely incredible and the dystopian city (sort of like Lang’s Metropolis crossed with Kowloon Walled City and populated with H.R. Giger creatures is one of the most richly detailed animated worlds ever realized on film. Technically, it is a marvel, but Hori does not have an equal talent for screenwriting. Frankly, his narrative is episodic and the application of internal logic is spotty at best. So be it. Viewers will really just want to explore this world—and Hori essentially offers up pretexts to oblige us. You can think of Junk Head as the film Shane Acker’s 9 aspired to be, but fell short of (especially since they were both expanded from earlier short films). Thematically, it would make a terrific pairing with Don Hertzfeldt’s clone-related short, World of Tomorrow, which is high praise indeed. Highly recommended, Junk Head screens again today (7/24), as part of this year’s Fantasia.